Kept mouth shut while husband bitched. Danced flawlessly after 3rd glass of wine. Made every ball of trash in waste basket, even a 3 pointer! Remembered everything on the grocery list when I went shopping. The brand new purchase of my power drill! Oooo, the shopping list one is an Olympic-level win. I’m designing, building, and installing a garden trellis right now. It’s when the power drill becomes a satisfying surrogate boyfriend. John, you really “licked” this one! It’s “letter” PERFECT! 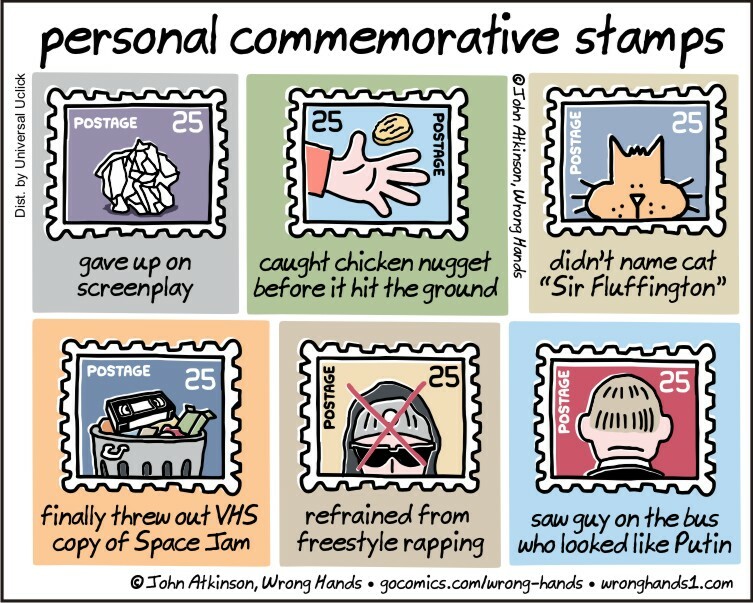 My personal favorite is “didn’t name cat Sir Fluffingotn.” Bravo. It’s got me thinking about my own commemorative moments……SCARY! Great idea for a comic strip. Love it!